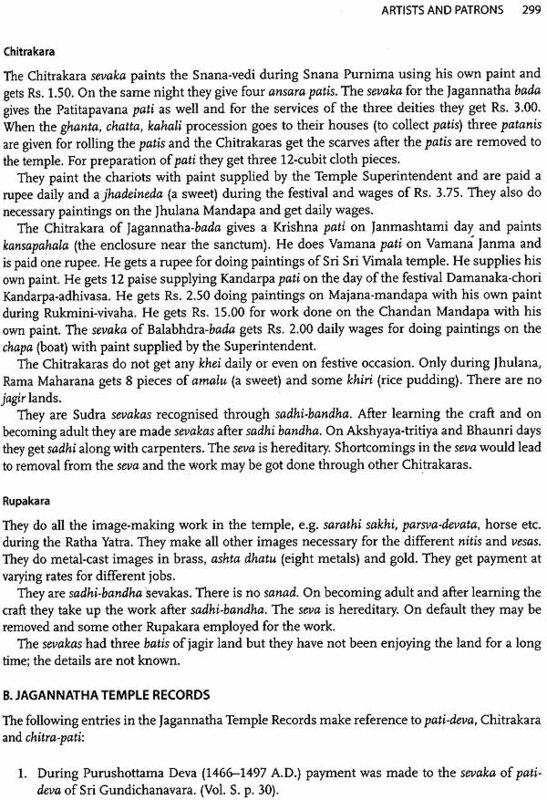 The World of art is complex and challenging more so in India because the documentation here is remarkably thin whatever exists is widely scattered and difficult to gather. Addressing these issues, this volume brings together an astounding body of material consisting not only of speculations or theories, but also of original, primary sources. Between the pages we hear sages speak of the interrelationships of the arts, practitioners records measurements of units of time and space, iconographers lay down measurements of units of time and space, iconographers lay down rules and practices, artists record their experiences, and patrons recount their delights. 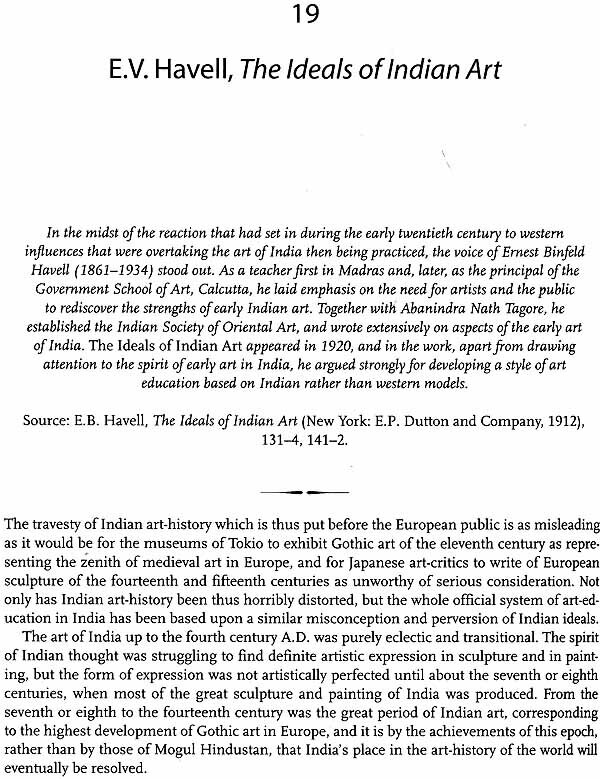 Oxford Readings in Indian Art traces the long, rich varied tradition of reflection on Indian art. 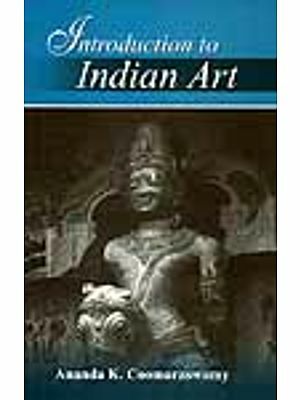 Organized into thematic section, the contributions range from texts on iconography and aesthetics and excerpts bearing upon our understanding of patronage and artistic practices, to information on artists and early writings that have shaped our thinking on Indian art. Slowly as one dips into these sources, one can hear the past speak and see the arts of India, which have been lost of history, come alive. B.N. Goswamy, acclaimed art historian, is currently professor emeritus of art history at Panjab University, Chandigarh India. He has held several distinguished poition: he has been visiting professor at many universities in Europe and the USA, including Heidelberg University, Germany ETH Zurich (Swiss Federal Institute of Technology in Zurich), Switzerland; the University of Pennsylvania, Philadelphia, the University of California, Berkeley and Los Angeles, and the University of Texas at Austin, in the USA. He has been the recipient of the Jawaharlal Nehru Fellowship, and the Tagore National Fellowship. He was honoured by the president of India with the padma Shri in 1998 and the Padma Bhushan in 2008. The putting together of a volume like this is a task. While there is evident need for under- standing what the practice and the state of the arts in India in the past was, and for that to go to original sources which can serve as 'Readings', doing this is not easy. For the sources are scattered; facts have be gleaned, slowly; statements made directly are few; much has to be read between the lines; and interpretations tend to vary. No histories of art appear to have been written in early India; no biographies of artists exist, nor have artists left any notebooks or memoirs of their own. Much knowledge, having been preserved within families and passed on orally from generation to generation, remains hidden. The hard information we have from the past, as far as the arts are concerned, comes to us thus in the form of whispers that one can sometimes barely hear. The limitations are clear. And yet, with some effort, a picture, somewhat hazy perhaps, can be reconstructed. For doing this the sources-primary, original, authentic, reasonably dateable, or securely dated-that one has to go back to and draw upon, are of diverse kinds and differ from period to period. 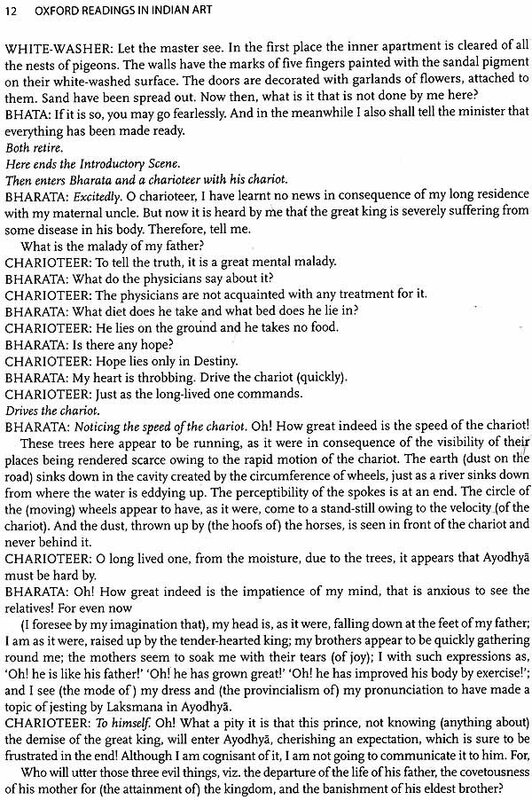 To take some examples from ancient India, there is that seminal text, Bharata's Natyashastra, which has extensive passages on how the arts come into being and how they affect, even shape, minds. The Puranas-Agni, Markandeya, Linga, Shiva, among them-s-even though essentially religious texts in character, yield information, for instance, on iconography, and contain legends in which the arts sometimes figure. 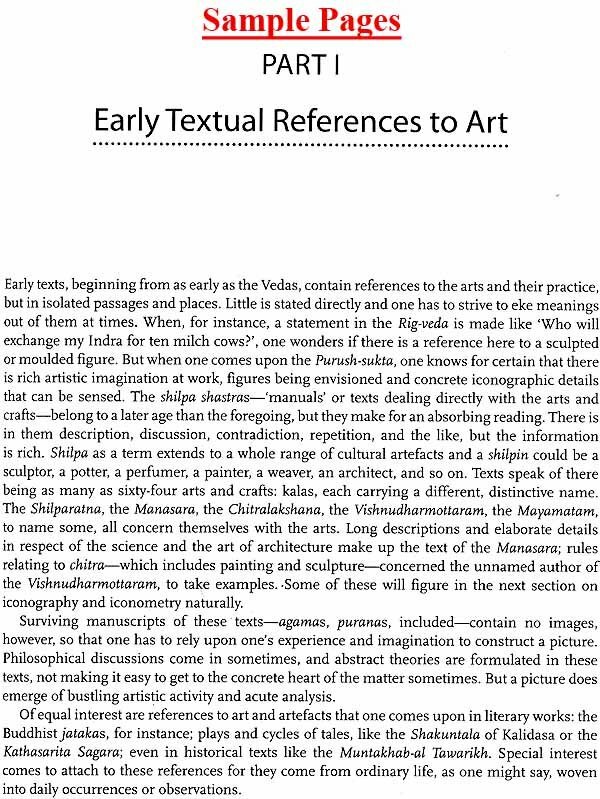 There are shilpa-shastras, the equivalent of manuals on art, which go into the making of images or structures-Chitrasutra, Chitralakshana, samarangana Sutradharo, Manasara, Abhilashaitartha Chintamani, Mayamata, among them-and contain most valuable passages on materials, processes, iconography, iconometry. 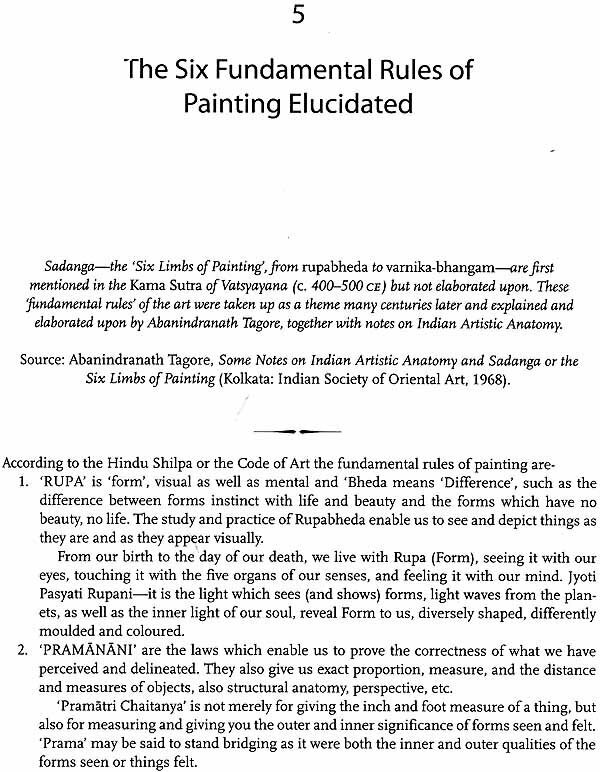 Related to these in some manner are works that, strictly speaking, come from the fields of the performing or literary arts-the sahitya Darpana for instance, or the Abhinaya Darpana-but have a clear bearing on the visual arts. 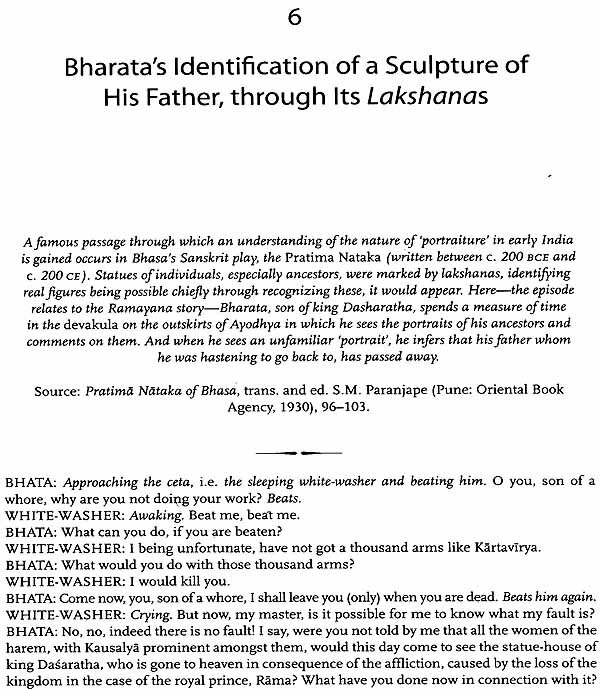 Works of literature, among them plays like Bhasa's Pratima Nataka, or Kalidasa's Abhijnana Shakuntalam, and cycles of stories such as the Kathasarita Sagara, provide insights into or descriptions of works of art. All of these have been drawn upon. Some things remain insistently obscured from sight, but there are others that come into full, sharp view. From the period that followed, unparalleled, in respect of the information it contains, is the Akbar period work Abu'l Fazl's Ain-i Akbari-which has a whole chapter on the 'Arts of Writing and Painting'. Notices of art appear in chronicles or memoirs, names of individual painters start emerging in this period, and an emperor like Jahangir devotes space in his Tuzuk for the work that his most gifted artists did for him: men like Abu'l Hasan and Mansur. There are no detailed lives of the painters, but some painters and calligraphers begin to turn from shadows into substances as much from notices of them in other peoples' writings, however brief, as from their portraits that have survived. 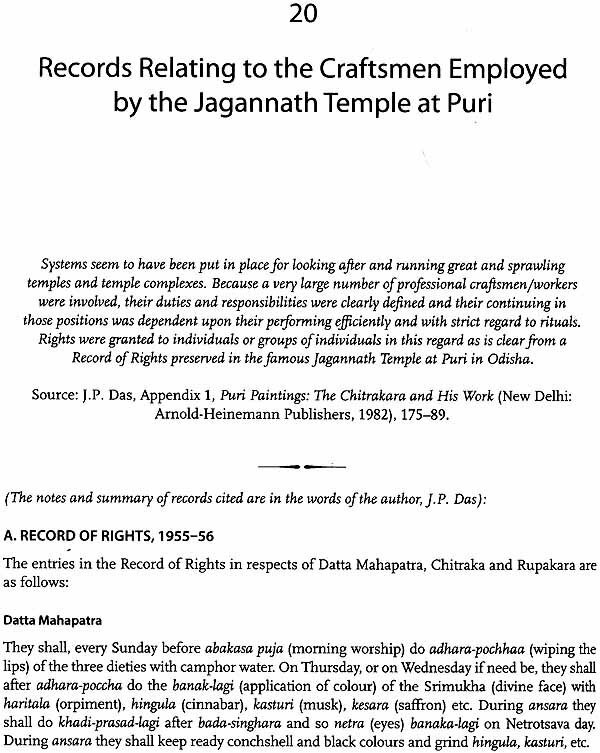 There were early visitors from the Islamic and Buddhist worlds-Fa Hsien, Alberuni, Taranath, among them-who observed and wrote about the arts in India. 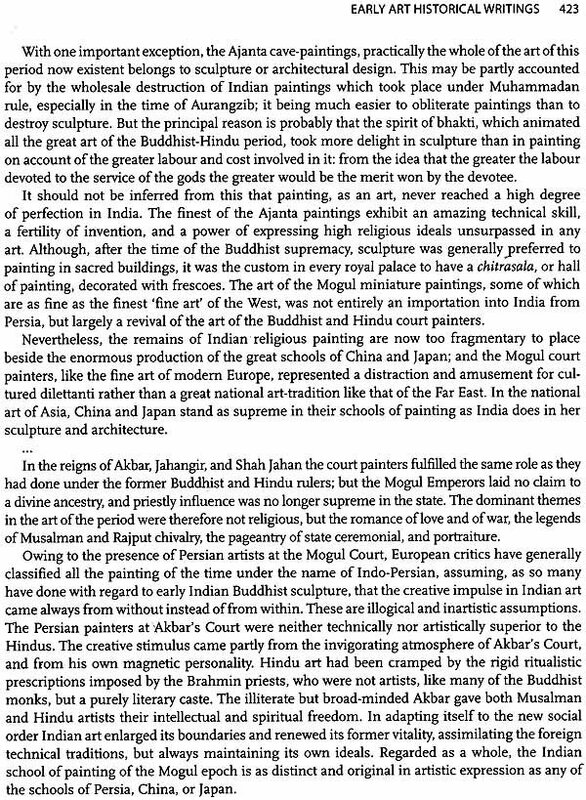 Writings from the Persian world which directly impacted or bore relevance to what was going on in respect of techniques and processes followed in Mughal India Bihzad's notes, Sadiq Beg's composition on the 'Laws of Painting' -are useful to draw upon. Truly valuable at the same time are the accounts left by European travellers and officers who came to India in a steady stream, from Jesuit priests and merchants and physicians to ambassadors to the Imperial court-Domingo Paes, Fernao Nuniz, Garcia da Orta, Father Monserrate, Johannes de Laet, William Finch, Thomas Roe, Bernier, Tavernier, Thevenot; somewhat later, Polier, Moorcroft, William Barr, von Orlich, and others-and the observations, some enthusiastic, others somewhat superior and cynical, they made on the arts in India. Their understanding of the grammar of these arts, and of their aesthetics, might have been partial, but their observation was sharp. Writing anything close to the history of art in India, or aspects of it, began no earlier than the early years of the twentieth century, but a fair body of material came together then. 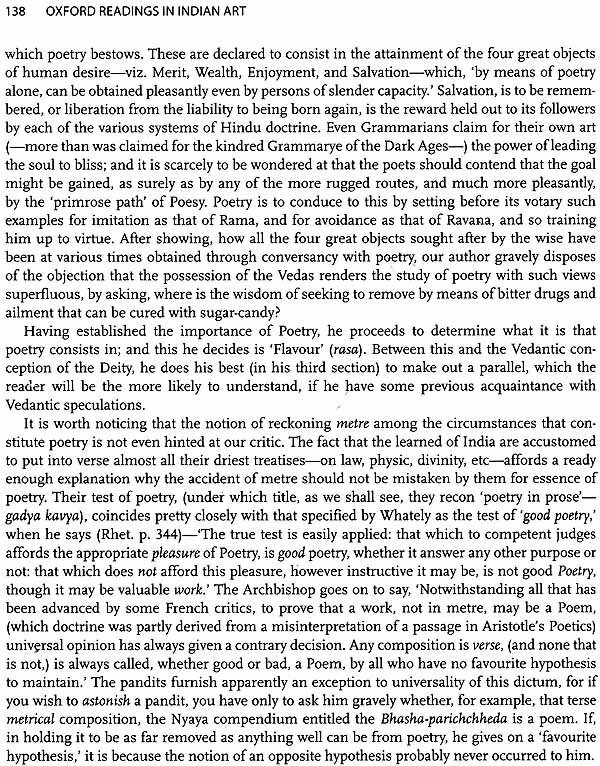 There were scholars who translated old but nearly lost texts and added their own comments on them; others took stock of what was on the ground and helped to deepen understanding; still others who brought little known, or virtually unnoticed, developments in the arts into the foreground, Gopinath Rao, Manmohan Ghose, P.K. Acharya, Ananda Coomaraswamy, J. Ph. Vogel, Vincent Smith, E.B. Havell, Abanindranath Tagore, J.c. French, Goetz and Kuhnel, Stella Kramrisch, N.C. Mehta, among them. Excerpts from their writings go legit- imately into the 'Readings' that this volume consists of. What has been set forth above might convey to the reader an idea of how things have been gone about, but there are other things that have also been researched, other sources drawn upon. In any case, the materials gathered have been organized under six sections: Early Textual References to Art; Icons and Their Measurements; Aesthetic Theory; Artists and Patrons; The Arts in Practice and as Observed; and Early Art Historical Writings. There is much overlapping in this ordering, and it is admittedly somewhat arbitrary. But we hope that it makes for some convenience of consultation. With the same consideration in mind, each section is introduced, or preceded by, what can be called 'head-notes'. A few things need to be stated about this effort. What is put together here is, in the nature of things, excerpts from sources, illustrative rather than exhaustive. The intention clearly is to lead the researcher/reader to those sources and by no means exhaust them. Other scholars might easily have gone for other sources or selections, and, naturally therefore, other readings. Some passages here run into several pages and there are others- inscriptions, colophons, and the like-that consist of no more than a few lines. But then that is of the essence of the material. An effort has been made, not always successfully, to provide some dates although perfectly secure dates, at least as far as early India is concerned, are the exception rather than the rule. Two things in the end. This volume concerns itself essentially with the visual arts and not the performing or the literary. Spreading out into those other fields would have required another volume. Likewise, the final section on Early Art Historical Writings, stops suddenly, and indefensibly perhaps, with the year 1947. What followed after that, we are aware, is filled with other riches, but those, again, deserve to go into another volume. Meanwhile, it is hoped that what is put together and presented here would provide some insights, as also factually prove of some value to those whom the arts of India continue to interest. Indira Gandhi National Centre For the Arts and Motilal Banarsidass Publishers Pvt. Ltd.